Enjoy a fantastic tour on our yacht to the beaches of Lanzarote where you can discover the abundant marine life underwater. We provide all the equipment (suit, mask, snorkel and fins) so you can swim among fish and coral visiting various places of great interest in the area of our tour. Enjoy the seabed and fauna under the supervision throughout your time of our expert crew. 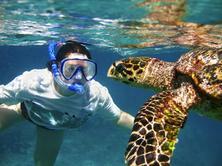 Aquatic tours are conducted in the less exposed and more protected coastal areas. The depths range from 1 to 10 meters, where it is possible to see and swim with species such as turtles, cattle fish, trumpet fish , barracuda , bream, grouper , viejas (old fish) , tuna and of course with other divers. A snorkeling day can be educational fun for all the family, it is ideal for all ages, with small groups and daily departures. Why not take one of our underwater cameras and leave with unforgettable holiday memories in this unique Biosphere Reserve. The clear waters of the Atlantic, abundant marine life and volcanic island backgrounds with stunning lava rocks that are strange and whimsical figures , and stunning lava rocks with strange shapes are without doubt the most spectacular places of our blue planet. The trip on our yacht is very exciting and entertaining. Experience the fabulous unspoilt beaches on the coast of Lanzarote; enjoy an unforgettable cruise with every possible comfort and with fantastic views of the coast of the island of Lanzarote.